Who is Elmer Bautista Francisco? Elmer Bautista Francisco was born on April 19, 1978. He lived and grew-up in Las Piñas City. He is the youngest of the Six (6) children of Jorge "George" Trinidad Francisco and Rosalinda "Rosie" Bautista Francisco of the Francisco Clan from Las Piñas City, the makers of the legendary Francisco Passenger Jeepney. Elmer studied and graduated Elementary and High School at Colegio San Agustin - Dasmariñas Village, Makati in 1992 and 1996 respectively. He was an officer of the Adeodatus Scholarship Trust Foundation and Sandigan Social Studies Club both focused on providing assistance and opportunities to the less fortunate but deserving youth. In college, he took up Bachelor of Science in Physics at De La Salle University, Manila, and Arts Bachelor in Consular and Diplomatic Affairs at De La Salle University - College of St. Benilde and graduated in 2002. Elmer was an officer of the Physics Society from 1996 to 1999 and the Batch President of the DLSU Student Council from 1996 to 1997. He also participated in the mock United Nations Assembly in 2001. Elmer was the President of the Las Piñas Mabuhay Jaycees at the age of 18. His inducting officers were Las Piñas City Congresswoman Cynthia Aguilar-Villar and then Jaycee National President Jimmy Yaokasin. During his term as President, the chapter hosted and organized various Jaycee activities including the Metro Area Conference, Ten Outstanding Young Men awards (TOYM), was part of the organizing committee of the Metro Area Mini Olympics (MAMO), organized tree planting activities, conducted weekly feeding programs for children, donated wheelchairs for the disabled, organized a number of medical and dental missions, provided scholarships to deserving students of Las Piñas City, provided livelihood projects in cooperation with different Barangay Officials of Las Piñas City, conducted various leadership seminars for the youth and members as well, awarded outstanding teachers and outstanding student leaders in public schools, and the list goes on. He firmly believes in the essence of the Jaycee Creed especially the last line, "And that service to humanity is the best work of life." In 2002, Elmer married Michelle Tiu Cabrera-Francisco from the City of Cagayan de Oro and they have one son, Dominic Cabrera Francisco. He is a very faithful husband and a very dedicated father who makes it a point to always spend time with his family despite his very hectic schedule. He says, "It's all about time management, creating an efficient system and loving what you do." He also follows one of his favorite quotes from the movie 'The Godfather', "A man can never be a real man if he doesn't spend time with his family." Elmer learned the ropes of business early in life while helping out his father in the family automotive business. Due to his early training, he was able to engage in business and profession early in life in diversed industries such as Automotive Retailing and Services, Information Technology, Trading, Technical Education, Security and Manpower Services, Firearms and Ammunition Importation and Retailing, etc. Business is a very tricky craft wherein you can't possibly have it all, but there is always plenty for everybody. The trick is that you lose some but you gain even more. As Confucius says, "Our greatest glory is not in never falling, but in rising every time we fall." In 2007, Elmer joined the Rotary Club of West Cagayan de Oro and became the youngest member of the club. He was given a task as the Information and Communication Technology (ICT) Club Director for Rotary Year 2007-2009, ICT District 3870 Chairman for Rotary Year 2008-2009, Rotary International Convention "On To Montreal" District 3870 Chairman for Rotary Year 2009-2010, Rotary Youth Exchange Club Chairman for Rotary Year 2010-2011, Club Vice-President for Rotary Year 2011-2012 and Zone 1 District Information Officer for Rotary Year 2011-2012. Elmer currently spearheads his very own ElmerFrancisco.org, a philanthropic organization. 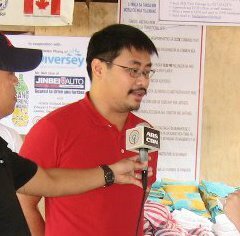 Also in 2007, Elmer joined the Cagayan de Oro Chamber of Commerce and Industry Foundation (Oro Chamber) and became a Trustee from 2008 to 2009 representing the Trade and Commerce Sector. As a Past Trustee, he was given a task as the Media Relations and Communications Committee Chairman of the Chamber from 2010 to the present. The Oro Chamber is the voice of business in Northern Mindanao. Elmer actively participated in the organization's spearheading advocacies that affect the local and regional businesses such as the controvertial protest for the BIR harassment, continuing search for solutions regarding the Mindanao power shortage and other power related issues that gravely affects the businesses and investments in Mindanao, the Oro Best Expo in cooperation with the the US Commercial Service headed by Mr. Patrick Wall - Commercial Attaché, of the US Embassy Manila, US Assistance for International Development (USAID) headed by Ms. Gloria Steele, the Department of Trade and Industries (DTI) Region X headed by Director Alice Eusenia and the Local Government of Cagayan de Oro City headed by Mayor Vicente "Dongkoy" Y. Emano, among others. Elmer was also an invited participant at the 1st US-ASEAN Business Forum at Cambodia. 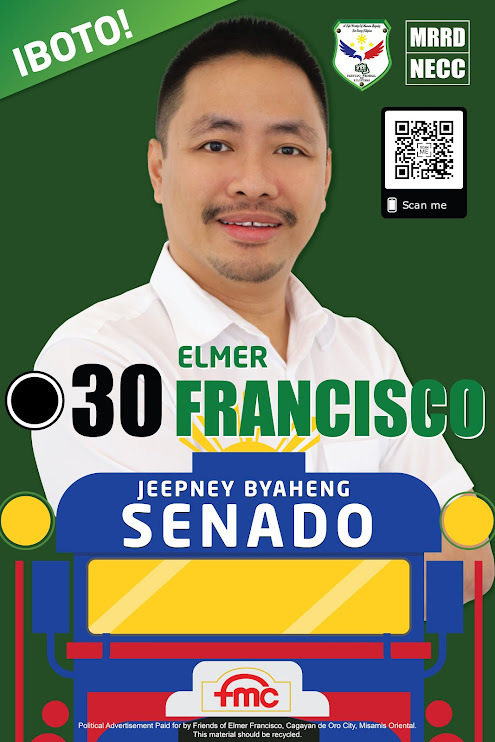 Founded and aggressively operated ElmerFrancisco.org which is a philanthropic organization with various projects like SENDONGPRENEUR Project (that started immediately days after the December 16, 2011 flash flood), Isang Litrong Liwanag and Isang Litrong Bahay among others. Etymologically, SENDONGPRENEUR means SENDONG + MOTIVATED wherein the project was created mainly to provide start-up capitals and training for Tropical Storm Sendong Survivors in the temporary shelters, those who are displaced in the community and in the evacuation centers based on their skills and livelihood before and after the December 16, 2011 Flash Flood washed out their homes and affected their families. eFF is working closely with various government and non-government organizations as a group known as 'SENDONGPRENEUR Livelihood Cluster' together with DSWD-Department of Social Welfare Development, CSWD-City Social Welfare Development, DTI-Department of Trade and Industry, DOLE-Department of Labor and Employment, OB-Operation Blessing, CRS-Catholic Relief Service, HRC-Humanitarian Response Consortium, IDRN-International Disaster Response Network, ILO-International Labour Organization of the United Nations, UNDP-United Nations Development Programme, Child Fund International, UNFPA-United Nations Population Fund, Bangon Kagay-an, Kagay-an Kaniadto Community Chat among others. Isang Litrong Liwanag is a project in cooperation with MyShelter Foundation that produces Solar Bottle Bulbs and aims to install a million SBBs within 2012. Isang Litrong Bahay is another project in cooperation with MyShelter Foundation that builds a training center to teach people how to build houses from empty PET Bottles with the help of DOST-Department of Science and Technology, MIT - Massachusetts Institute of Technology and Hassel Studios. With Isang Litrong Liwanag and Isang Litrong Bahay projects, we could keep away those empty PET Bottles that we just usually throw away and end up being burned in dumpsites or clogging our drainage systems; moreover, we could turn them into Solar Bottle Bulbs and Affordable but reliable houses. Elmer dreams and envisions a strong Philippines where every Filipino would be proud to be a Filipino. It's no easy task but very possible. As Elmer says, "What really counts are 'WHAT you want' and 'WHY you want them', God and Universe will take care of 'HOW'. Just stay extremely focused and very positive no matter what is happening and do everything with LOVE."